The newly-canonized Saint Teresa of Calcutta is especially compelling, I think, because many of us remember when she was still alive, serving the most vulnerable and needy. Saint Teresa did more than serve, though–she inspired through her words and her example. Heidi Hess Saxton has collected some of Saint Teresa of Calcutta’s most inspiring words and paired them with prayers, daily Mass readings and calls to action in a newly-published seasonal daily devotional. 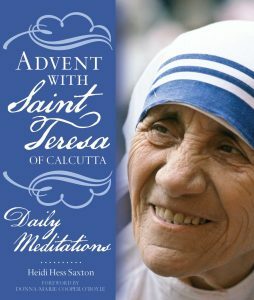 Advent with Saint Teresa of Calcutta: Daily Meditations offers food for thought and prayer for any reader who is devoted to this fascinating saint. Advent devotionals based on daily Mass readings are difficult to put together, as Advent does not have the same number of days each year, and there are special feasts (St. Nicholas, the Immaculate Conception and Our Lady of Guadalupe) to consider as well. Heidi has taken care to offer a guide to navigating the liturgical calendar as you read this book, so that it can be used year after year. As a reader, I appreciate such attention to detail! Advent with Saint Teresa of Calcutta actually runs through the Octave of Christmas, with a bonus meditation for the Feast of the Baptism of the Lord, so be sure you don’t put it away on December 24. This daily devotional for Advent is one you’ll be able to stick with; I had a hard time putting it down! I highly recommend praying with this book through the Advent season and Octave of Christmas.